All you’ve got to do is drive across America….You’ve got plastic light boxes that say Radio Shack and Chicken-Bicken and Roller Skate World. That’s what America looks like today. I don’t like what the light box has done to America at night….If they had just outlawed these light boxes, the world would simply look bigger. 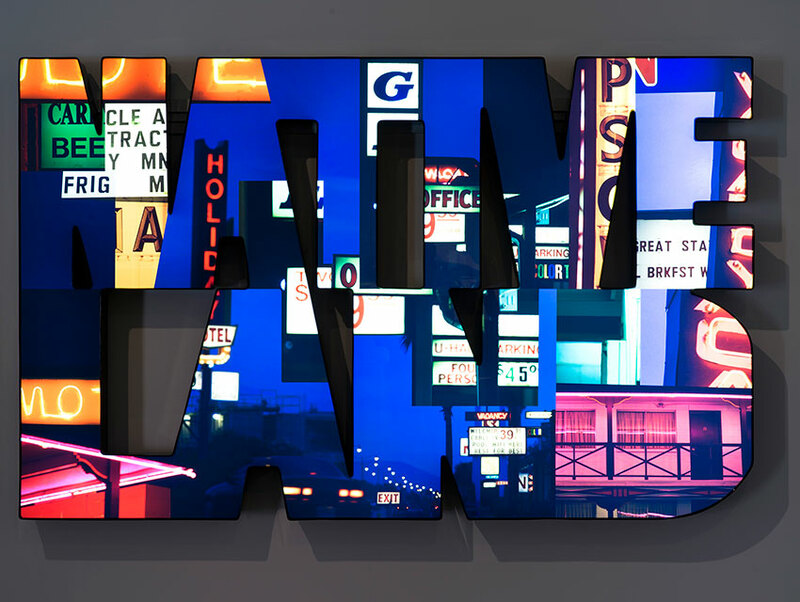 Doug Aitken’s “Native Land” radiates with images of the light boxes, neon diodes, and electronic advertisements that dominate the American roadway. Beaming out from the letters in the piece’s title, a cacophony of fractured words, colors, numbers, and architectural details light up against the evening sky. As our eyes dart from one photographic fragment to the next, the psychological experience of viewing “Native Land” recalls the familiar physical and cultural experience of speeding past these obtrusive wayposts out on the open highway. We may have no interest in looking too closely at any one of them, but their omnipresence on the landscape seeps relentlessly into our consciousness. These roadside messaging devices may epitomize the banality of hyper-commercial culture, but in “Native Land” their influence seems even more pernicious than that. Bombarding our field of vision, Aitken has suggested, the bright lights evince both violence and desperation as their glare washes out the visible world. What else is left to see when these signs, one after another after another, keep flashing before our eyes? An obvious irony of Aitken’s work is that “Native Land” is itself a light box, one of several currently on view in his new show at Regen Projects in Hollywood. Though we also encounter these electronic pieces one after another as we navigate the gallery, the cumulative effect is the opposite of what their commercial counterparts impose on us as we drive by. Rather than keep moving, we are compelled to stop and contemplate the messages conveyed by these light boxes and the other works assembled in this exhibition, powerfully named Still Life. The Regen Projects gallery has been raeconfigured for this show, and its walls appear to have been torn apart, burrowed, and punched through to create appropriate space for Aitken’s works. In addition to the light boxes and other wall pieces, the show’s highlights include the ethereal glowing ghost of a public telephone, which reacts to the atmospheric influence of nearby bodies, and a dioramic configuration of stalactites and stalagmites in steel and foam situated in its own room. The electronically enhanced reverberation of the falling water resounds through the darkened chamber in which it resides. The calming effect of this final work in Aitken’s show may remind us that there is still life to be experienced outside the artificial assault on our senses by a too-busy world. Doug Aitken will be signing copies of his latest monograph, 100 YRS, at Regen Projects on Saturday, October 4, from 6 to 8 p.m. There will also be a durational sign spinning performance from 4 to 8 p.m.